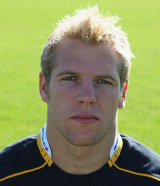 James Haskell can play in any of the three positions across the back-row and will play for London Wasps in the 2012-13 season after brief sojourns in Japan and New Zealand. From an early age he was earmarked as the potential successor to Lawrence Dallagio at Wasps and he took his bow for the club side at the age of 18. By 2006-07 he was a regular in the Wasps side, citing his Man-of-the-Match performance against London Irish that season as a turning point in his career. He was a replacement in Wasps' Heineken Cup triumph later that year but previous to this, he made his England debut against Wales in March 2007. Included in England's preliminary World Cup squad in 2007, he missed the cut but was recalled for the Six Nations. An injury cut his tournament short and on return he again had to battle back into the side in time for defeats against South Africa and New Zealand, becoming one of four players sin-binned against the All Blacks. In 2009 he surprised many by accepting a move to Stade Francais but his performances there continued to keep him in the England team and he impressed in some otherwise disappointing matches, including scoring a brace of tries against Wales in the opening game of the 2010 Six Nations. He started every match of the championship-winning 2011 Six Nations and retained his place for his side's dismal Rugby World Cup that autumn. He was one of those in hot water following an off-the-field incident at the team's hotel in Dunedin. By then he had left France - a move forced on him by Stade Francais' finances - and journeyed to Japan to play for the Black Rams. After thnis he moved to New Zealand for a season in Super Rugby where he turned out for the Highlanders and vied with the likes of Adam Thomson for a spot in their back-row. He returned to the international scene on England's summer tour of South Africa, when he was handed a start in the final test against the Springboks. But come the announcement of the EPS for the 2012-13 season, Haskell was handed a spot in the Saxons but there's every chance he could still feature for the senior side in the autumn internationals if he impresses at Wasps.